Hi kids! Can you believe there are only a few weeks left until Christmas? I know I can’t. Things are super busy here at the North Pole. The reindeer have been busy training so they are all ready to pull Santa’s sleigh; the elves have been making and finishing toys at a furious pace; and the engineers have been fine tuning the sleigh for the big night. I know some of you will be getting out of school soon and will need an activity to keep you busy for a little while. So you don’t forget everything you learned in school, I asked Eirlys, one of our promising young wordsmiths, to put together a couple of word searches for you. These are like the ones we did last year. 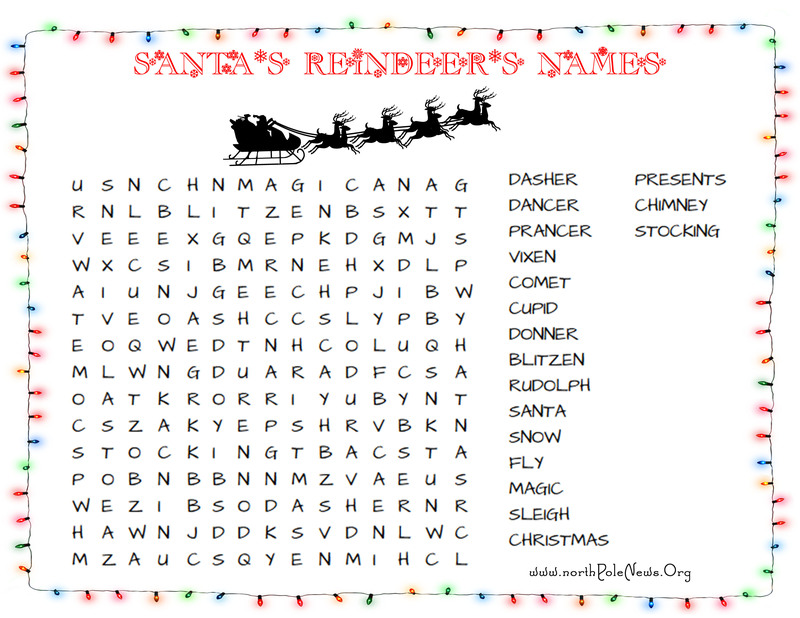 One word search is based on the reindeer’s names. I know you all know their names. 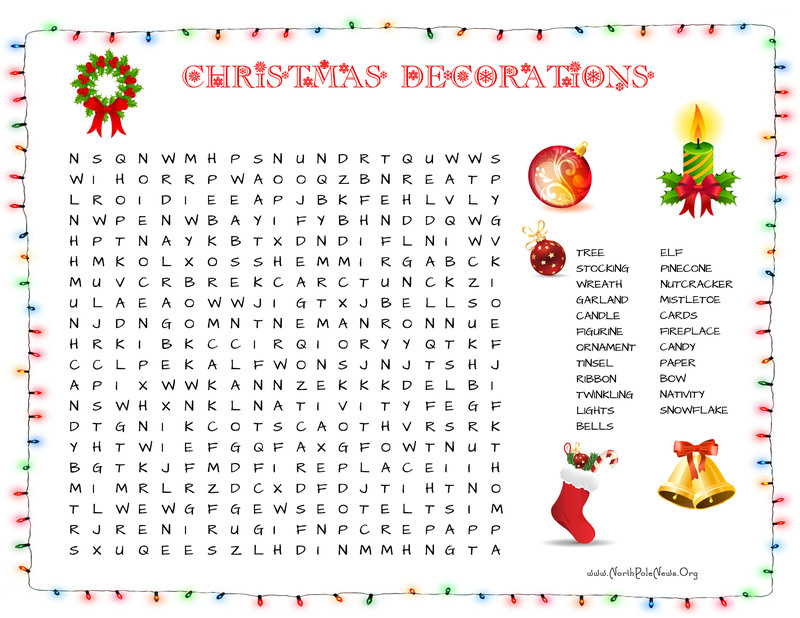 The other word search is based on Christmas decorations. For these two, the words can be found going up or down, diagonally, or frontways or backways. I hope you have fun. Eirlys probably won’t like me telling you this, but because most of you likely aren’t familiar with her name, I thought I would tell you a little story. Eirlys means “snowdrop”. On the day Eirlys was born, her mother was was walking down the lane when a single drop of snow fell on her nose. While this isn’t that strange in winter, Eirlys was born on a warm, sunny day in July. Because we love snow sooooooo much up here at the North Pole, we believe this is a fantastic omen and foretells that great things will happen. In this case the great thing that happened was the birth of a healthy baby girl. Have your Mom or Dad help you print one of the word searches below. They can click on a picture and it will open up in a new window and they can print it from with the browser or save it to your computer to print later.